Labeo Bata or more commonly known as Bata, is a popular sweet water small fish, native to both India and Bangladesh. Bengalis love for fish is well-known, without having a generous piece of fish our protein intake is not complete or rather say not satisfied. Bengalis love this small fish for its sweet taste but the fine bones of this fish also deters some from having it. But if you can keep your patience and with a bit of care, you can enjoy the fish. Bengalis cook every fish with variants of spices to bring out the taste of the fish. 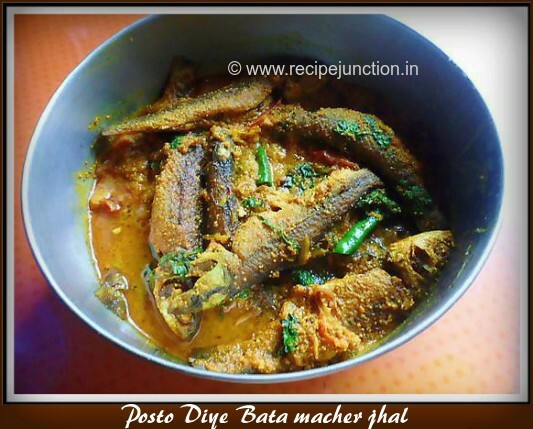 Bata fish is also cooked with mustard seed paste(sorshe jhal) or a simple jhal with tomato and spices(tomato jhal) or with an exotic spices like poppy seeds (posto jhal) which tastes great with piping hot rice. 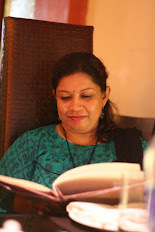 If you are wondering what is "Jhal" then you must know that a fish curry with little and thicker gravy is known as "jhal" and a fish curry with thinner gravy is known as "jhol" in Bengali cooking dictionary. 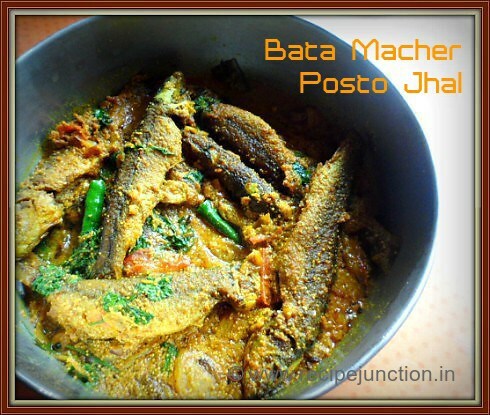 Today I'll share the recipe of Bata macher posto Jhal. Other sweet water fish like Rohu or Katla(carp) can be cooked also in the same way. Usually, we don't add any vegetable in this curry, but one can add few pieces of potatoes in the curry. Bata Fish : 4-5 nos. Poppy seeds : 2 tblsp. Clean the fish and smear little salt and turmeric powder and gently rub on all over the fish pieces. keep aside for at least 1/2 an hour. Heat 2 tblsp. of mustard oil in a pan, add the fish pieces and fry on medium heat till golden brown on both sides. Remove from heat and keep aside. Make a coarse paste of poppy seed adding green chillies( if using). Do not grind into fine paste. heat 1 tblsp. oil in another pan, add sliced onions and fry till they change the color. Add diced tomatoes and saute till they are soft, then add poppy seed paste and turmeric and red chilli powder. Mix well everything. Now add 1 cup of water and season with salt. Add the fried fish pieces and cover with a lid. When gravy thicken a bit and fish soaks some of the gravy, remove from heat. Serve immediately with piping hot rice.